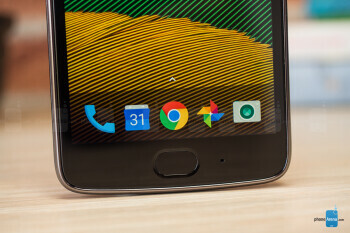 In the past few years, the Moto G series has set a standard in affordable phones that few can match. This year, Lenovo has two G series phones: the Moto G5 and the Moto G5 Plus. The G5 Plus is the one that has gotten all the attention so far: it’s got the powerful and very battery-savvy Snapdragon 625 system chip, it’s got a fast Dual Pixel auto-focus camera, and it has a starting price of just $230. And then there is the Moto G5 that we have up here for review. It’s a much different _phone_ than the G5 Plus and this is important to know: it has a smaller, 5” display, it has the severely less powerful Snapdragon 430, a completely different camera and half the on-board storage. And it’s also not available in the United States, and this one is an even more important distinction. Why? Simple: price of the Moto G5 Plus might be set at $230 in the USA, but in Europe and the rest of the world it rocks a much higher, €280 to €300 price (equivalent to no less than $305). This higher price opens the space for the Moto G5: a €230 _phone_ that would make no sense in the United States. Are all the compromises made to get to that lower price worth it, though? We take a deeper dive in the Moto G5 experience to see what living with a dirt cheap phone is all about. Stick with us for some interesting conclusions. A chubby phone with decent design for the price. You simply cannot complain about options when it comes to phone design in 2017. Even the affordable Samsung Galaxy A series bring an impressively stylish glass and metal look, while many others bring sleek metal designs. But the Moto G5 does not even qualify as an affordable phone: it’s even cheaper. Because of that, we're inclined to accept certain compromises in its design, like the overly thick bezels, or the somewhat uninspired appearance. 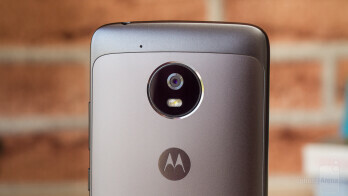 While not a looker in any way, the Moto G5 is at least practical: no fingerprint smudges, no screaky parts, just a solid construction that we think will withstand the test of time very well. Nothing more than that, unfortunately. You have your fingerprint scanner at the front: it’s fast and accurate enough, just like most of them these days, and we like the front position. It’s not a physical button, though, so it will not click. All the physical buttons are on the right: they are plastic, but also very clicky and the lock key has texture to it, so it’s easier to recognize it by tactile feel alone. On the top there is a 3.5mm headset jack and on the bottom of the device is a microUSB port. Yep, we wish it was USB-C as well. The phone lacks any special water protection, so we recommend you keep it safe and dry. A very likable 5” 1080p LCD display that can get very bright and has nice color balance, but those oversized bezels belong to the past. The Moto G5 features a 5-inch LCD screen with a 1080 x 1920 pixel, Full HD resolution. Save for the oversized bezels that give the phone a dated look, the screen is actually quite nice. The resolution is sufficient to have everything looking sharp and crispy. The colors are also surprisingly nicely balanced. 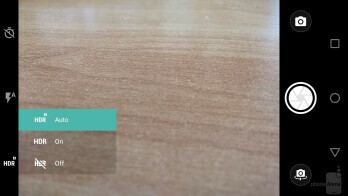 You have a standard color mode that displays ‘realistic color’ as Moto itself puts it, and you have a Vibrant mode that shows ‘enhanced color and saturation’. Try both to see which one you like better, but keep in mind that the difference between the two is not as huge as on say Samsung phones. We also ran our complex tests on the displays that show fairly good color balance for such an affordable phone. It's just a bit on the blue side, but nothing particularly bad and the screen can get very bright, which contributes to better outdoor viewing experience. Check out the full display benchmarks below. And then there is the Moto G5 that we have up here for review. It’s a much different phone than the G5 Plus and this is important to know: it has a smaller, 5” display, it has the severely less powerful Snapdragon 430, a completely different camera and half the on-board storage. And it’s also not available in the United States, and this one is an even more important distinction. Why? Simple: price of the Moto G5 Plus might be set at $230 in the USA, but in Europe and the rest of the world it rocks a much higher, €280 to €300 price (equivalent to no less than $305). This higher price opens the space for the Moto G5: a €230 phone that would make no sense in the United States. Android 7.0 Nougat with some cool features added by Moto, but we never got fully used to the optional ‘one button nav’. The Moto G5 comes with Android 7.0 Nougat on board with a very light Moto skin on top. 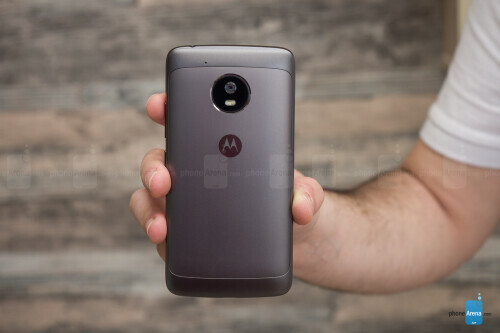 The extent of the Moto skin is mostly limited to the custom gestures: things like the double chop action to start the flashlight or the dual flick wrist gesture to start the camera. Those are nice things to have. 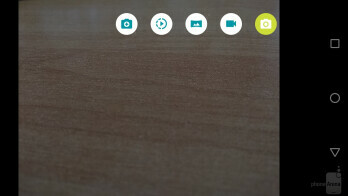 We also like the new swipe up app drawer: it’s quick and intuitive, and we’re happy to see it on the G5. You also have a couple of cool widgets: a big 3-in-1 (weather, time and calendar) widget on both the home panel and the lock screen, which is nice. You also have peek notifications from the lockscreen, so you don’t have to unlock your phone to take a quick look at what’s new. The phone also recognizes when you raise it and automatically lights up the time on the lockscreen. The biggest question mark that we have around the experience is about the new ‘one button nav’. It’s not enabled by default, but it’s cool, so we decided to try it out. 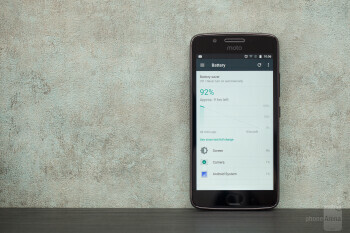 You toggle it on or off via the Moto app and not the settings, so keep that in mind. So what does it do? It uses the fingerprint scanner on the front as a navigation button: tap it once to go home, swipe right for recents, left - for back. Sounds cool on paper and allows you to disable the space-consuming on-screen navigation keys, but we just could not get used to it perfectly. The back action in particular that we use so often, the phone would mistake for something else or not register properly the first time. After some time, we just switched to using on-screen nav keys that we are sure we will hit right every time. The Moto G5 comes with the Google Assistant on board. You bring it up by long holding the home key in on-screen navigation and it’s a fast and reliable voice assistant. A bit of a stutter here and there does not ruin the show in the daily grind. The phone runs casual games fine, but more demanding ones drop frames. The Moto G5 ships with the entry-level Snapdragon 430 system chip by Qualcomm. The chip is built on the quite dated 28nm technology, and it features an octa-core setup with 8 Cortex A53 cores running at up to 1.4GHz. The phone has also got 2 gigs of RAM. The actual performance is mostly fine in your daily grind. We saw no disturbing lag to compromise the experience, but you see that slight stutter here and there. This is obviously not a gamers’ phone: the 1080p screen resolution is a bit of a challenge for the Snapdragon 430 in games, where you will see dropped frames more often than you’d like. Of course, you will still be able to play most game: we actually ran Asphalt 8 with a few dropped frames, while less demanding titles like the cool Dan The Man ran much smoother. The built-in 16GB of storage is definitely a limitation on the Moto G5. Out of those 16 gigs, only around 7GB are actually left for the end user. All phones in this price class come with 16 gigs of storage, but nonetheless, one should understand that this is a big limitation for most people. Luckily, the phone also supports microSD card expansion, so that you can add up to 128GB card to its storage capacity. Keep in mind that both the microSD and SIM card slots are located under the phone’s back cover: you have to remove the back cover, shut down the phone and remove the battery to be able to insert or switch a SIM or microSD card. The Moto G5 is not sold in the US and does not support US LTE bands, but it is perfectly compatible with 4G LTE in Europe. 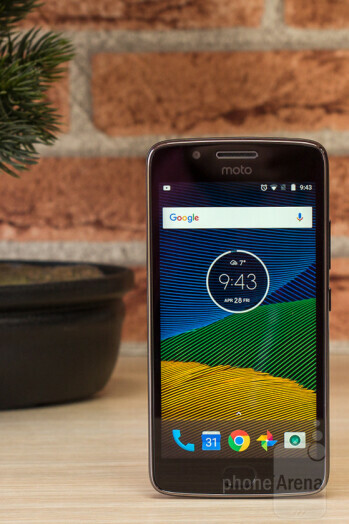 The Moto G5 is not and most likely will not be officially sold in the United States, so it’s no surprise that it lacks 4G LTE bands for the U.S. market. In Europe and other global markets where it is sold, it does, however, have proper 4G LTE connectivity. The full list of 4G LTE frequencies includes bands 1, 3, 5, 7, 8, 19, 20, 28. The actual browsing experience is somewhat hampered by the slower processor as we noticed the default Chrome browser slowing down here and there, but not too much for this to be an issue. In terms of additional connectivity options, the only major thing that is missing is NFC and support for mobile payments. 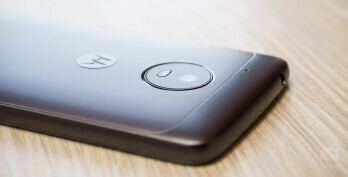 The Moto G5, however, has dual-channel Wi-Fi, which is a nice touch for an affordable phone, it has Bluetooth 4.2, as well as GPS and Glonass. The microUSB port on the bottom only supports USB 2.0 speeds. The G5 can capture decent images if it ever focuses (focusing is way too slow), but in video it surprises with a very good stabilization. 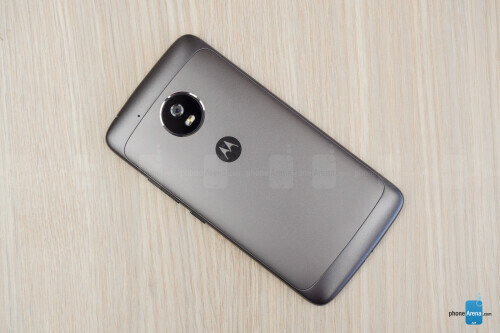 The Moto G5 features a 13-megapixel rear camera with an f/2.0 aperture, single LED flash and with support for 1080p Full HD video, while up front there is a 5-megapixel cam. These days we don’t care too much about those numbers, what matters is actual image quality. 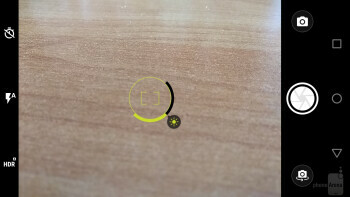 Before we get into that, let’s just say a few words about the Moto camera app: first, you can start it with the cool double flick of the wrist or you can double click the power/lock key. It’s fast to start and comes with the auto HDR option enabled (you have the HDR toggle quickly accessible), there is also a flash toggle as well as controls for timer. 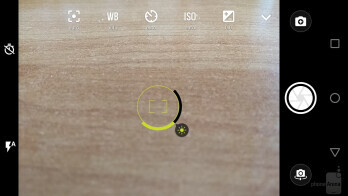 To record video, panoramas slow motion or enter pro mode, you tap on the camera button above the shutter key. You get to the settings by swiping right from the edge of the camera. The Moto G5 captures pictures that look decent for such an affordable phone. Decent, but not good or great. The biggest issue with the camera is that it is very slow to focus and capture a picture, especially if your subject moves just a little bit. We ended up with a lot of blurry images because of that. The good thing is that you have plentiful detail and the images strike a good balance in terms of sharpness, when you get an image in focus. The bad thing is that all images are definitely too contrasty with the blacks and shadows ending up almost always too dark. The front camera is not particularly impressive either. The 5MP selfie snaps paint skin color and the whole image with a very weird yellow/green tint and have a very contrasty look that does not make people look flattering. You don’t have a lot of detail either. As you can see, we have even more gripes with the front camera than with the rear one. The G5 can also record video of up to 1080p resolution at the pretty standard 17Mbps bitrate. We were surprised with the built-in stabilization option: video stabilization is usually the one area where affordable phones fail miserably, but not this here Moto G5. Video recordings have the same overly contrasty and not perfectly dynamic look, but they do not look terribly shaky. Focusing is a bit on the slow side, but you have continuous auto-focus. Overall, the G5 does not do great in video, but it surpassed our expectations for video from an affordable phone. Good job, Moto! Interestingly, the loudspeaker on the Moto G5 is built inside the earpiece on the front. This is actually a nice choice: it means that sound is coming directly at you when you watch YouTube videos or play a song. The quality is decent: it’s not the loudest, nor the clearest, it’s just decent, but most phone loudspeakers fall in that category. We wish it had a bit more depth to it, as it currently sounds a bit tinny. Of course, you also have a 3.5mm headset jack for headphones that you can use to get much better quality of audio. A phone is above all a phone, and that’s why it’s important to know whether call quality is good. On the Moto G5 it is decent, but not great. 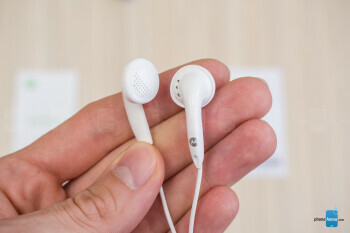 We found that voices in the earpiece lack in clarity when compared to a higher end phones. Our callers sounded muffled and a bit too quiet, and on the other end of the line our voice also sounds a bit distorted. Keep this in mind: it’s not a huge disadvantage as you can still understand what the other party is saying in most circumstances, but clarity is definitely not perfect. A battery that will get you through a full day with ease, but not much more. Also, no fast charge support means the phone takes more than two hours to charge up. 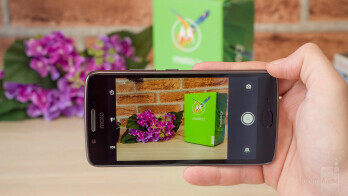 The Moto G5 comes equipped with a 2,800 mAh battery cell that is easily removable by the user, and we were eager to test it to see the battery life of this affordable phone. 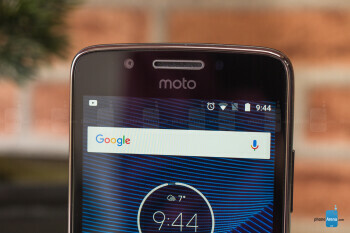 We have recently seen a lot of affordable phones score huge battery numbers, so we were wondering whether the Moto G5 would be one of them. The answer is: no. The Moto G5 battery life is good, but nothing more than that. 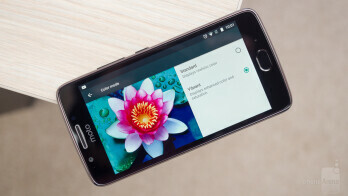 In our test, where we put all phones on equal grounds with the screen set at the comfortable for indoor use brightness level of 200 nits, the Moto G5 scored just slightly more than 7 hours and a half. In real life situations, we had no problems getting through a full day with even more intense use of the phone. This is good, but do not expect the Moto G5 to last you more than that: you will need to charge it up every night. Another aspect of the battery experience is how long it takes to recharge a battery from 0 to 100%. 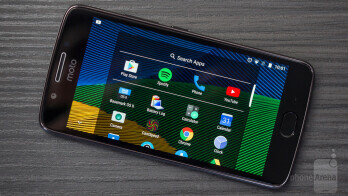 The Moto G5 is not among the fastest charging phones by any means: it takes a pretty long two hours and nearly 15 minutes to get a fully charge. 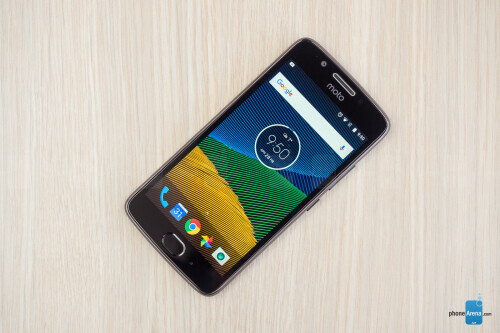 The Moto G5 is not officially sold in the United States. You do get the Moto G5 Plus in the U.S. and that one is a great phone. So where does the Moto G5 fit in the big picture? 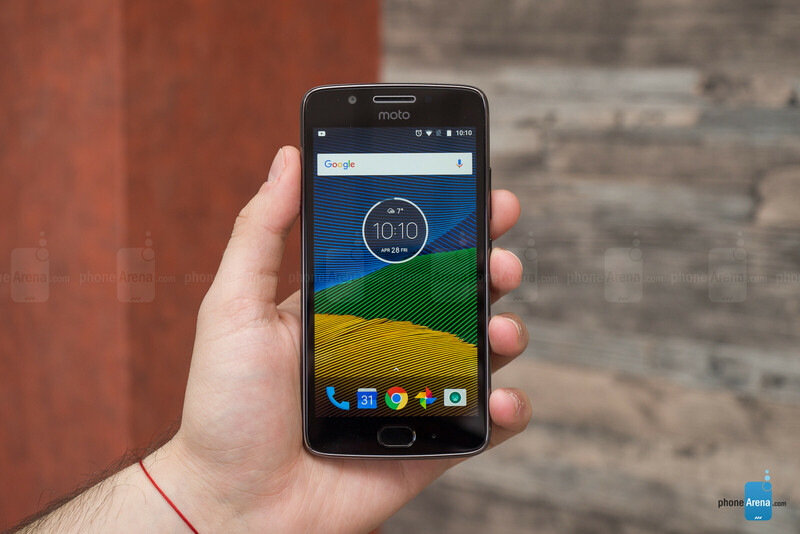 With an official price starting from around €200 in Europe, the Moto G5 is considerably cheaper than the Moto G5 Plus, which starts at €280. The Moto G5 is also much cheaper than other typically recommended affordable phones: the Samsung Galaxy A3 (2017) is excellent but sells for €290, the iPhone SE 16GB is great buy retails for €330. 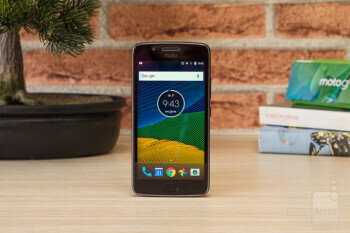 This super cheap price segment that the Moto G5 belongs to is all about compromise, though, and the G5 makes a lot of those compromises: the design is outdated, the camera is decidedly average, battery life is good, but not great, and the performance is decent, but not future-proof. That said, we can't deny the fact that the Moto G5 presents us with what's probably the best possible all-around experience at this super-low price point.